VirtualGeula.com operates as your personal bibliographer. We do our utmost to find and buy your Sefer directly from the publisher, author, distributor, or dealer. If it is out of print we often find a used copy or make you a facsimile copy from a scan at a fair price. VG displays Seforim like a bookstore but it is different. We are your agents, we do the shopping for you. We take a personal interest in your Seforim needs. This site is about Ahavat Torah and Ahavat Sefer. 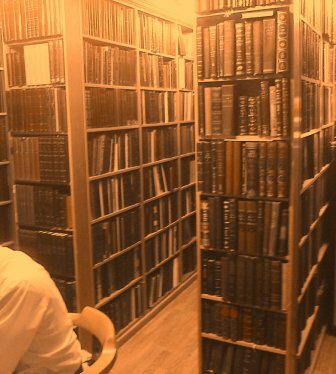 The Judaica Archival Project (JAP), a non-profit Preservation and Access Project for Jewish books, was founded in Jerusalem in 1986 with the blessings of leading Rabbis and scholars. VirtualGeula.com (VG) is the website of JAP since 1997. Since 2004 almost every Sefer ordered on VG has been recorded in our Seforim in Demand Catalog. Register only once and from then on use the contact form or simply email your request. Please identify the Sefer and its exact WEB address in one of our catalogues or a book search may be charged. After we receive your order-form or request we will reply by email to clarify any missing details. When your order is ready for shipping we will email an invoice for your inspection. The following day your credit card will be charged and the Seforim will be shipped that week. Become a member or subscriber! Use the order-forms and send all the information you have about the book. Instead of asking for a pre-quote you can set a price limit and we will SEND IT as long as it is below your limit. Instead of asking the cost of shipping – Use the Doar calculator: (Note a standard vol. of 450 pages weighs 1 kilo packed. Packing and handling is 15 shekels per parcel and 25 shekels for parcels over 5 kilo. By default, we register all shipments. You may choose non-registered mail but at your own risk. Basic insurance is available from the Israeli Post Office at low prices. All orders over $100 to first-time customers will be insured by default. Airmail (book-rate) and EMS shipping are recommended. UPS, FedEx, DHL etc. are also available. Please go to the Israel Postal Authority CALCULATOR to figure out your shipping costs. Prior to actual packing and shipping, we can supply shipping estimates only. If you have a business or office address this is highly preferable. Many home deliveries are returned to Israel if no one opens the door to sign! Note – You can save on Delivery Costs: If you will be visiting Israel send ahead your shopping list and we will collate your orders and send them to your hotel or apartment. We forward to local addresses (up to 20 kilos) via post office courier in Jerusalem for 60 shekels and elsewhere for only 100 shekels. If you are buying in bulk (over 100 kilo) we can send via sea freight or air freight. Terms: This is a unique door to door find buy and ship service. Please read these terms before you order. We are a book finding service and not a store so search charges will apply to titles not quoted from our online catalogues. Subscribers and Members pay less for searches. Many Jewish books are published by the author in small editions and are only sold from the author’s home. If the author will not deliver a physical pick-up charge of 35 to 75 shekels will apply in Jerusalem and 75 to 125 shekels outside Jerusalem. If any pick-up charges apply they will be detailed on the invoice that we send you before charging your order. A service charge of 35 shekels will apply for: pre-quoting current books that are not listed in our website, payment via any means other than a credit card, invalid credit cards, phone calls outside of Israel to obtain missing information. A 5 shekel test charge may be submitted the first time we use your credit card if you don’t become a member. No other charges will be made until the book you order is ready for shipping and you have been notified by email. Service charges will be detailed in the invoice we email you. All communications will be via email so please respond by email. If we do not receive an answer to a query or a price quote within 3 days we will assume that the edition or quote we emailed you is OK and we will proceed with your order. Your credit card may be charged twice: Once when your order is ready and a few days later for shipping costs. Please state a time limit for your order. Sometimes it can take up to 60 days to find a Sefer that is out of print. If no time limit is stated after 24 hours cancellation may not be accepted before 60 days. If there is a delay finding some of the items in your order, we may send out what we have found after 10 days and the remainder will follow when it is available. Please combine small orders. A minimum order is 100 shekels for non-members and 50 shekels for members. Since we deal with many suppliers, some of which may ship directly to you, bear in mind that orders of books from different catalogues may arrive in different packages. Generally, we will hold and collate your order for 10 days and then forward what is ready. The other books which are delayed will be sent separately as they become available. Pricing in Publishers Showcase: Pricing policy varies greatly between publishers. Some price-lists are wholesale and others are retail. Some are frequently updated and many are not. In certain catalogues, we have erased the prices to eliminate confusion. In others, we explain the price structure on that publisher’s homepage. Prices on site are always estimated prices and are not final. In any case, a detailed invoice with final prices will be sent by email for approval before we charge your credit card. Pre-quotes for books not found in the catalogues online will always require a search charge since the process of finding the best supplier with the lowest price is identical to a book-search. The price on the shopping cart is the price for that book the last time it was sold. If several years have passed this price may be no longer exact. In this case, the quoted price on the invoice sent before charging is the accurate final price. Note: Please ask about quantity discounts. Even ordering three copies of a Sefer may result in a significant discount! VirtualGeula is responsible to get the item you ordered to the shipper of your choice by the time we promised. We cannot be responsible for mistaken orders on your part or negligence on the part of the shipper beyond our willingness to help you claim for lost or damaged books from each shipper according to his policy. Most Israeli publishers will replace a faulty book (missing pages etc.) with little trouble but will not pay the shipping costs to resend it to you. Refunds when applicable may be paid in Shekels as a credit against future purchases. Arrangements for exchanging books must be made directly between you and the publisher or distributor. Facsimile copies may have missing lines or pages if these were missing in the original. All of the used books appearing on our website are displayed with pictures and a description for your examination. Please read the description carefully and ask any questions you feel necessary. These books are sold as is, at direct outlet prices, and may not be returned or refunded. We never share your email or personal information. Our registration form is SSL secure. We are not connected to a network. We are protected by firewalls, anti-virus, and anti-spy ware on our computer and server.